I was looking for a second hand SQN when I came across the TW-LP4S from Hungary. It seemed too good to be true, a mixer with all these facilities for less than the price of a second hand SQN, so I took a risk! The mixer arrived last Friday and I had a busy weekend with very little time to play with it before a job using it on the Monday. Now, I have to say that everything I say below must be qualified! I constantly had to remind myself how little I’d just paid for it!!!! So below is my little review. On the Sunday night I frantically sorted out all my kit for the following morning trying to make sure everything worked for the next day. My first operational issue in the garage was a little disappointing; the headphone amp would not drive my Beyer high impedance headphones. Panic then ensued whilst I tried to find my back-up pair, but when I did eventually find them, the mixer worked fine driving the Sony’s. The next little issue I had was the headphone volume, which is a screwdriver slot? All the other knobs are nice machined aluminium so I did find that a little puzzling as to why? I’m sure there must be reasoning behind it but I just found it a pain (although you can use your finger nails so don’t chew them!). As a plus, there are both ¼” and 3.5mm jack sockets for your headphones, and a monitor knob for Left, right, Mono (L+R), Stereo and M/S (L-R) decode. So I plugged the mics in, tested cables, all working, pack away. The mixer is of American influence, in that all the switches operate upwards. Different, but easy to get used to. Having said that it does have backlit UK PPM’s with peak/limiter LED’s, which is a great plus point. The whole layout is actually very good and well thought out, everything is more or less where you want it (unlike an SQN!). It’s very solidly made, again from machined Aluminium giving it a very robust and professional feel. Although at over 2kg (with batteries), you won’t call it a lightweight mixer! Power comes from 12 (yes 12) AA batteries or there’s a 4pin XLR for an external power supply (which comes with the kit). The power switch is on the front (where it should be), but there is no ‘off’ position – if you think about it if it’s plugged into the external mains dc supply why do you need to turn it off? If you do want to use a large battery like an NP1 to power the mixer, there is an extra adaptor available to fit to the rear of the mixer rather than use the 4 pin XLR input. DC input is 10-25v. The main channel faders have a nice weight and are very smooth and easy to use. It’s possible to have one finger on the fader and use the PFL as well as the bass cut. A pan switch/knob is also associated on the front with each channel giving Left or Right, Mono (centre) and also a stereo gain function for both 1 & 2 and 3 & 4 channels. Tone is also there on the front, together with Battery check, a good limiter with ‘link’, a slate button and the mixer out (label EE for some reason?) and return monitor switch. You actually have the choice of two different return feeds on the right hand side made up of either 3.5mm jack or hirose inputs. Unfortunately the Rtn1 and Rtn2 select switch is also on the side instead of the front (oh well can’t have everything!!!). Finally there is a main fader, which is a rubberised plastic knob (as opposed to the rest which are Aluminium), which is ok, but I would personally have preferred the same type as the channel faders, it looks a little odd as if it’s been replaced? Also the knob is a smooth click-round fader with a good feel but there is no ‘click-lock’ default position, which could be a little disconcerting. The main fader has a +6db gain if you need it, which you may well do. I maybe wrong, but my impression in use is that it sticks to another Americanism in that the channel faders unity gain is measured at full fader, not at as a rule the 2-3 o/clock position as we’re used to (which indeed the main fader adheres to?). Without the main fader and a soft voice on an ECM77 I had very little gain left to use and the channel fader. Also the main fader is after the tone so affects its level, yet the meters are before the limiter so although the limiter LED’s flash and you can hear the effects, when in use you can’t see these effects on output level’s. The left hand panel takes the balanced XLR mic inputs with both line ad -10db pads available. You’ve also Dynamic, phantom (12v and 48v) and T powering available with a main Phantom off switch to save power if you need it. The right hand panel has single L&R XLR balanced, a Hirose and a 5 pin XLR unbalanced outputs with a mic/line switch for the Hirose. 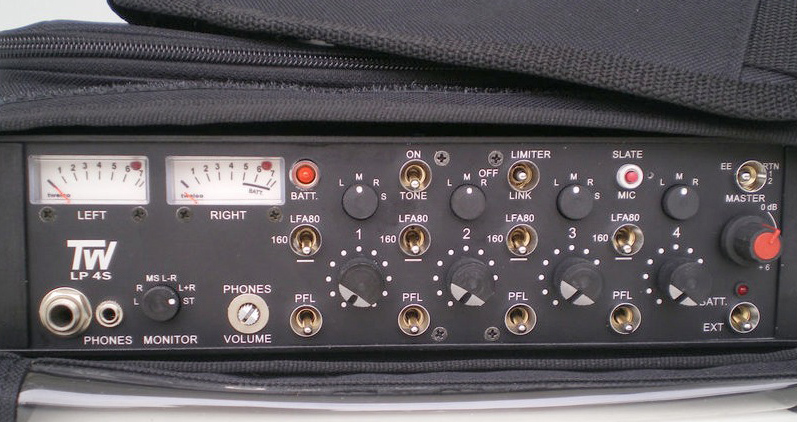 There is also a 3-pin XLR marked “video Assist” which is a mono -36db output for comms etc. Direct outputs of each channel are provided on a 5-pin mini-XLR if separate recording is needed. RTN 1 not only comes via the Hirose, but has a 3.5mm jack as well, the RTN2 is 3.5mm jack only. In use I found it to be very quiet and it sounded very good. I have to say that I think this mixer is brilliant value for money and I couldn’t recommend it highly enough (even with the odd short coming). New, they retail for under £1000 USD and I’ve seen manufacturer-refurbished models on eBay for about £400 including the carry bag. 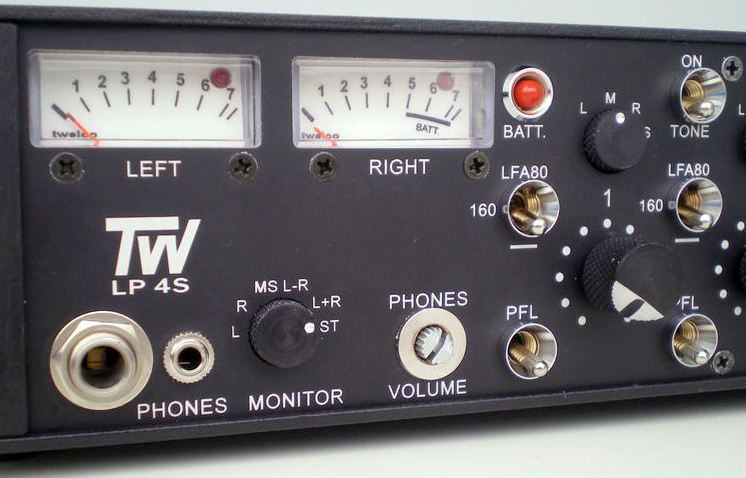 I think I’ll get long use out of the TW-LP4S, and maybe the only thing I think perhaps I need, is to look at the exact effect the meters have on the outputs or even whether perhaps I can talk to the manufacturers about altering the place where it monitors level? There are other models of mixers in the TW range and if there as well made and as good value as this mixer, I wouldn’t hesitate to recommended them. This entry was posted on Tuesday, February 14th, 2012 and is filed under Audio, Technical & Practice. You can follow any responses to this entry through RSS 2.0. You can leave a response, or trackback from your own site. Having talked to the manufacturers in Hungary, who were very helpful, acquired the user manual and taken the lid off, there are main gain settings inside which make it possible to achieve the channel fader settings referred to above. With the right tone source it’s fairly easy to do. Also they were helpful in suggesting alternative connections for the meter drivers to achieve monitoring of the main outputs, post limiter. The insides are well laid out and modular, all on separate PCB’s, but I wouldn’t attempt this mod unless you very experienced with a solder iron!